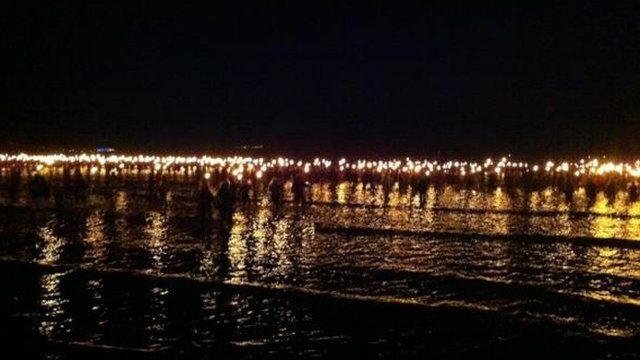 Weymouth Bay was set alight as 2,012 people waded into the sea holding flaming torches to mark the start of Olympic sailing events in Dorset. Thousands of people flocked to the beach to watch the celebration, which included performers from Britain and Brazil. Battle for the Winds featured a cast of over 150 performers, and was produced by Desperate Men and Cirque Bijou as part of London Festival 2012. The cast included Breathe, a company of 64 disabled and non-disabled and non-disabled performers. The winds - north, east, south and west - were represented by local groups clad in a variety of Monty Python-esque costumes and elaborate headgear adorned with wings and whirling blades.